Where can I pay my property taxes? Why have I not received a property tax statement? Why did Jacinto City change how it manages property taxes? Can I use the drive thru at City Hall? Can I use the night drop at City Hall? Can I have a garage sale? Where do I pay my property taxes? Can I rent the Community Building at Town Center? What are the court’s office hours? Where can I pay a ticket? Can I mail a court payment? Can I pay with a personal check? Does a child need a parent to go to court with them? How old do I have to be to attend Heritage Hall? Do you provide “Meals on Wheels”? How much do the meals cost? What activities do you offer for senior citizens? Is Heritage Hall available for rental? Does my pet need a city tag? How many pets are allowed per household in Jacinto City? Who can I call if my pet is missing? Can the humane officer pick up stray cats? Who can I call if I see loose dogs in the neighborhood? Can I keep chickens on my property? Who do I call for a dog bite? How do I get a fire report? How do I get an EMS Report? How do I get an EMS Bill? Can our group or class visit the fire station? Can the Fire Department provide a speaker or a fire truck at our event? Why can’t I always choose the hospital when being transported by EMS? What programs are available for children? What programs are available for adults? Can I rent the pool? Can I rent the Gym? Can I rent the Meeting Room located inside the Milton Lusk Youth Activity Center? Can I rent the Pavilion located in the parks? Can I rent the baseball or softball field? Who can use weight room? How much does it cost to swim at the swimming pool? Does Jacinto City have a preschool program? How old does my child have to be to enroll in preschool? Can I get more information on the preschool program? Where do I report water or sewer emergencies? Why was my water not turned back on after I paid my bill? Why does my water look rusty? How can I get my street paved? Can I get speed bumps on my street? How can I keep my street or ditch from flooding when it rains? Who do I contact if our streetlight goes out? Mosquitos seem really bad. Can the city do anything about it? Can I have my fingerprints done at the police station? How can I have my property returned to me? How do I get a copy of an arrest or offense report? Does the Jacinto City Police Department have a civilian ride-along program? What are the visitation hours at the jail? Where can I get a copy of the No Smoking ordinance? What Businesses are covered by this ordinance? When does the ordinance take effect? What is the penalty for violating the No Smoking Ordinance? What type of signs are required to be posted? Where are signs required to be placed? The drive thru is for your convenience when paying water bills. All other payments must be made in our lobby. The night drop at city hall is for your convenience when paying water bills and court payments after hours and weekends. It is located in the drive thru and is labeled “Night Deposit”. Please do not place cash in the night drop. Personal checks are accepted for water bills but cannot be accepted for court fees. Other payments must be made in our lobby during normal business hours. Yes, garage sales are permitted in Jacinto City. You will need to obtain agarage sale permit from City Hall. Permits are $ 20.00 and available during normal business hours. The garage sale permit application can be downloaded in fillable PDF format under the “Forms” tab on our website. Property taxes can be paid at City Hall during normal business hours. Water bills are due by the 10th of the month and can be paid at city hall or Sellers Grocery. For your convenience city hall offers a drive thru and a night drop off for payment of water bills on the East side of City Hall. 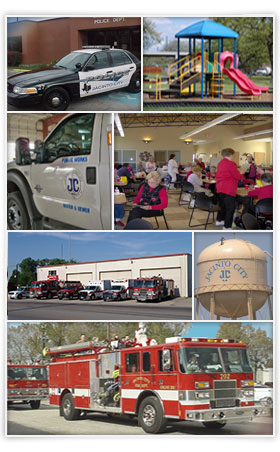 Yes, Town Center’s Community Center is available for rental by residents of Jacinto City. The Rental Agreement form is available under the forms section of our website. Be sure to read the “policies & rules” section carefully. Jacinto City Municipal Court is held at 1025 Oats Road. From Mercury Drive, turn East on Challenger Seven drive (at the Fire Station). You will see the Town Center on the right. Court is held in the Town Center’s community building. From Market Street turn North on Oats Road. The Town Center will be one block north of Market on your right. Court is held in the Town Center’s community building. Tickets can be paid to the court clerks at City Hall or during the court session at the time of your hearing. DO NOT SEND CASH OR CHECKS. ONLY MONEY ORDERS OR CASHIER’S CHECKS ARE ACCEPTED. Only Cash, money orders or cashier’s checks are accepted. Yes, all juveniles must be accompanied by a parent or legal guardian. Yes, if your dog and/or cat are over the age of 4 months and lives in the city of Jacinto City, they must have a rabies vaccination and city tag. You can purchase your city tag at City Hall by presenting a certificate that your pet has been vaccinated by a licensed veterinarian. The City of Jacinto city animal registration tags cost $10.00 and are issued and renewed annually, the same date the rabies vaccination expires every year. The city of Jacinto City hosts a rabies clinic in April each year. Please watch our website for exact dates and other details. Only three pets per household are allowed in Jacinto City. Our office number is 713-453-7411. You should also call the SPCA at 713-869-7722. No, we do not have the license or the facilities required to hold cats. You can purchase small animal traps at most hardware and feed stores. As a reminder, we strongly recommend that residents do not leave pet food outside where stray animals can find it. Who can I call if I notice loose dogs in my neighborhood? When not on their own property, dog owners are required to have their pets on a leash. Any pet on your property must be physically confined to the premises by an enclosed fence or a leash. For loose dogs call 713-453-7411. Be sure to give us a good description of the dog. No, all forms or poultry and foul including chickens, roosters, guineas, etc… and other livestock are prohibited in residential areas of Jacinto City. All impounded dogs are held for three work days and either reclaimed by their owners, adopted or euthanized. All efforts are made to place dogs with new owners prior to euthanasia. If the dog is not redeemed within three work days, it shall be considered to be abandoned and made available for adoption. If there is a significant injury CALL 911 immediately! If the bite is minor call the Public Works Department at 713-453-7411. After hours and weekends please call the Police Dispatcher at 713-672-2455. They can contact the Humane Officer. In order to obtain fire reports please contact the Fire Chief at 713-674-8424 or fax the request to 713-675-8525. In order to obtain EMS reports please fax the request including a patient affidavit to 713-675-8525. Be sure to include the date of service on the request. In order to obtain an EMS bill please contact Specialized Billing Inc. at 281-330-9837 or 1-800-999-2417. We love to have children visit the fire station. Just contact the Fire Chief in order to make the necessary arrangements. Please bear in mind that emergency calls may interfere with station tours or other public relations events. The Fire Chief can be contact at 713-674-8424. Can the Fire Department provide a speaker or a truck at our event? The Fire Department is capable of providing speakers on several topics including but not limited to; Fire Prevention, Fire & EMS Careers, Stroke & Cardiac Emergencies, EMS Hospital Utilization, and CPR. Why can’t I always choose a hospital when being transported by EMS? Today’s EMS functions as a delegated medical practice. As such, we operate under set medical protocols that dictate many of the decisions made respecting patient treatment and hospital destination. Some factors that decide hospital destinations include, patient and family preference, hospital accreditation for specific problems such as Trauma Centers, Stroke Centers, Chest Pain Centers etc…, hospital diversion status, local system status, and traffic issues. When the patient’s preference can be accommodated we will transport to the hospital of their choice but there may be times that the issues stated above dictate transportation to a specific facility for initial treatment or stabilization. Once the emergency situation is resolved the patient can be transferred to another facility if it is medically acceptable. The recreation department provides several different programs for children. Many programs are seasonal so please check back to this web site for continuous program updates. Winter Adult Programs include: Boot Camp Fitness, Aerobics, B.O.P. (Battle of the Pounds) Club, Boxing, Open Play Basketball, Open Play Volleyball and a weight room. Spring Adult Programs include: Boot Camp Fitness, Aerobics, B.O.P. (Battle of the Pounds) Club, Boxing, Open Play Basketball, Open Play Volleyball and a weight room. Summer Adult Programs include: Boot Camp Fitness, Aerobics, B.O.P. (Battle of the Pounds) Club, Boxing, Open Play Basketball, Open Play Volleyball, Weight room and Open Swim. Yes, the pool is available to be rented by both Jacinto City Residents and Non-Residents. Please see Pool Rental Agreement or contact the Recreation Department for more information. Yes, the Gym is available to be rented by both Jacinto City Residents and Non-Residents. Please see Gymnasium Rental Agreement or contact the Recreation Department for more information. Yes, the Meeting Room is available to be rented by both Jacinto City Residents and Non-Residents. Please see Meeting Room Rental Agreement or contact the Recreation Department for more information. Yes, the pavilions are available to be rented by both Jacinto City Residents and Non-Residents. Please see Pavilion Rental Agreement or contact the Recreation Department for more information. Yes, the fields are available to be rented by both Jacinto City Residents and Non-Residents. Please see Ball Field Rental Agreement or contact the Recreation Department for more information. Can anyone use the Gym? Yes, everyone is welcome to enjoy the City’s gymnasium facility. Non-residents must pay a daily fee of $5.00. All Jacinto City residents will be issued a membership card for free. Everyone must present I.D. or membership card to gain entry. Anyone 18 years old or older can use the weight room facility. $1.50 per person, seniors over the age of 60 are free. How old does my child have to be to enroll? Children must be 3 or 4 years old September 1 to be enrolled in our preschool. During business hours call the Public Works Department at 713-453-7411. After hours and on weekends please call the Police Dispatcher at 713-672-2455. They will notify the Public Works Department. Usually this is due to water line repairs in your neighborhood. Please call the Public Works Department if you notice rusty or dirty water. Our office number is 713-453-7411. The city budgets for asphalt projects each year. We repair and repave streets as money is available. Projects are prioritized based on a needs analysis. This helps assure that the worst areas are repaired first. Who do I contact if there is a street light that is out? Street lights are maintained by Center Point Power Company. They can be reached at 713-207-2222. If you have trouble reaching them the Public Works Department would be happy to report it for you. Just call us at 713-453-7411 or email us at publicworks@jacintocity-tx.gov Please be ready to give us an exact location of the light pole and the pole number. The pole number is posted on the pole. Who do I call for traffic signal malfunctions? These can be reported to the Public Works Department at 713-453-7411. If the malfunction occurs after hours or on weekends please call the Police Dispatcher at 713-672-2455. Participants must meet eligibility provisions as stated in the Older Americans Act. Participants must be 60 years old of age or older/or meet the eligibility criteria to receive a congregate meal as described in DAD program instructions. Yes, Congregate meals are served Monday thru Friday at 12:00 noon. A 2 (two) day meal reservation is required. Participants are encouraged to contribute $1.00 (Dollar) donation towards the meal program per meal. Yes, Transportation is provide to the center and back home for those who live in Jacinto City, Galena Park and Songwood at No Charge. Check our monthly calendar. New monthly calendars will be available on the 4th Wednesday of every month. While Heritage Hall is not available for rent, the large community center in the same complex is available. It has three sections which can be rented individually or as one large room. The rental application and rules are located in our forms section. Yes. Fingerprinting is done every day until 7pm. However, you must provide your own print card and there is a fee for the service. Any property that is available to be released must be done by appointment only. Appointments can be made with the Chief Monday – Friday 8am – 5pm. Accident reports can be obtained anytime in the lobby of the police department. There is a fee for each report that must be paid by cash or money order. Arrest and offense reports require the completion of an open records request form and the submission of the appropriate fee. The open records request form can be downloaded from the Forms section of this website. Please complete the form and bring it by the police department for processing. Yes. However prior to riding with an officer, the civilian must complete the appropriate paperwork for approval. The paperwork must be APPROVED prior to any ride-along. Visitation is from 9am – 11am only. In order to visit a prisoner you must bring valid identification. Property taxes must now be paid to Harris County. Click here for payemnt locations & methods. Your Jacinto CIty tax bill is now included with your Harris County Tax Bill. You can obtain a copy here. City tax bills must be paid to Harris County. Why did Jacinto CIty make changes to how it manages property taxes? Jacinto City’s tax billing vendor no longer provides that service. This afforded the city an opportunity to enter into an agreement with Harris County to provide all property tax related services at a greatly reduced rate. While saving our taxpayers money, this change also allows property owners to pay taxes over the phone or online. Harris County also accepts credit and debit cards. The ordinance has been posted at: jacintocity-tx.gov under the “Public Notices” section. Signs must read “NO SMOKING” in bold type of at least 1 inch in height or be of the internationally recognized standard illustrated below. “No Smoking” signs are required at each entrance and other areas where smoking is prohibited. Where can customers or employees be allowed to smoke? Smoking may be permitted outside a business within a reasonable distance of not less than 20 feet from entrances, operable windows and ventilation systems.